VANCOUVER — As negotiations continued between Vancouver Public Schools and the union representing nearly 700 paraeducators, secretaries, clerks, and other employees, members of the Vancouver Association of Educational Support Professionals (VAESP) gathered outside district headquarters to march and chant. “What to we want?” organizers prompted with bullhorns. “Fair contract now!” over a hundred marchers shouted back. The rally comes on the eve of the first potential VAESP strike in over three decades for Vancouver School District. Jeannette Hathaway is a secretary who has been with the district for 32 years and says she’d rather be at work tomorrow than on the picket line. The district thought it had a deal in place when VAESP agreed to a tentative agreement December 21. But the union says what they eventually received from the district for their members to vote on January 15 was different than what they’d agreed to. The sticky issue, it appears, is COLA. The state approved Cost of Living Adjustments for educators, and VAESP says the district’s initial proposal included a 10.2 percent raise this year, in addition to that COLA of around 2 percent. The district’s actual proposal was 10.2 percent inclusive of the COLA. “There’s just such a breakdown of communication,” lamented Hathaway regarding the recent labor unrest at districts across the region. At its most recent meeting, 93 percent of VAESP members voted to approve a strike starting Friday if a deal isn’t reached. In response the district’s Board of Directors this morning authorized action to seek an injunction to force the employees back to work. “That’s an indication that they weren’t ready to focus all of their energies at the table,” said Woo. “The Washington Supreme Court and Attorney General have determined state law (RCW 41.56.120) prohibits strikes by public employees and authorizes civil injunction proceedings and other remedies to require compliance by educational employees and their representatives,” they said in a statement released to ClarkCountyToday.com. The district also notified parents to be aware that a strike by VAESP would result in the cancellation of classes until either a deal is reached, or a judge orders the employees back to work. VAESP employees have been working without a contract since August 31, 2018. That, at least, the two sides can agree on. The potential strike, and the seeming impasse between the district and her union, caught Hathaway off guard. VAESP says the average member of their union earns $20,000 a year, despite the important work they do. The district says their most recent offer would include a total of 10.2 percent more money this year, with an expected two percent COLA bump next year. 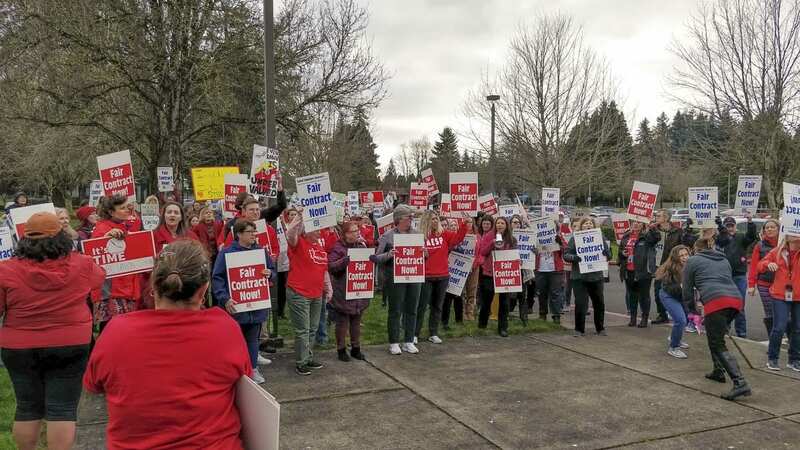 An offer of a third year with added spending, contingent on state funding, was rejected by the union, which is reportedly seeking a one-year deal with a total raise of 12.2 percent. The district has announced plans to cut nearly $8 million through some staffing reductions. They are expected to announce another $3.29 million in cuts next month as the district looks to close an $11.44 million budget shortfall. Much of that they’re blaming on the state’s efforts to fix the funding of basic education that made over a billion dollars of one-time funding available, but also cut into local funding levies. Several local lawmakers have said they’re interested in talking about potential adjustments during the ongoing legislative session in Olympia, but it’s unclear how much of an immediate difference that would make for local districts. ClarkCountyToday.com will update this story as needed.